Greengrass's kinetic style and character involvement really makes this movie leap off the small screen. It's not the same, but it's still thrilling. The primary advantage of owning this DVD? You can watch that impossible-to-follow guns-a-blazin', spin-around-crash ending of the big car chase in 1/4 speed -- and figure out what the hell is going on. Greengrass's commentary track is an interesting listen for "Bourne" fans, with the director talking about structure and screenwriting choices while appreciating little details and pointing out moments in the performances that speak volumes. He also goes into detail about what it took to put together that car chase, and more than one of the DVD's featurettes addresses the chase. One of them is about the innovative stunt rig created for this film to shoot the chase from many angles inside each car. Another entertaining extra covers the stunts and explosions, another the fight scenes, and another the extensive use of real-life locations. But several more (there's a dozen or so) are largely promotional or self-congratulatory fillers clips (one is about how great the cast is). Of course no mention of why "Identity" director Doug Liman bailed out of this sequel, and that's what I'd really like to know. So-called "explosive" deleted scenes (which are vaguely interesting at best, and which would have been more so with director's commentary). Staying 100-percent true to the surprising, cerebral, cliché- and catch-phrase-eschewing spirit of 2002's "The Bourne Identity," screenwriter Tony Gilroy (returning from the original) and director Paul Greengrass have put together a breathless sequel with tense intellectual punch, smart, seat-gripping action, and a hero who is utterly compelling, almost without saying a word. Still suffering from amnesia and nightmarish recovered flashes of his past assignments as a CIA assassin, the now-tempered Jason Bourne (Matt Damon), and the girl (Franka Potente) who helped him survive a relentless manhunt in the first picture, begin "The Bourne Supremacy" having their peaceful incognito existence on an Indian beach shattered by a rogue Russian secret service agent (a silently daunting Karl Urban) with a sniper rifle. In one of the film's few conventional contrivances, the plot is set in motion when, after a nerve-racking chase through the tight, ancient streets of this third-world seaside town, their jeep plummets off a bridge and this otherwise professional killer heads home, assuming they're dead. Bourne in turn assumes the CIA has come to finish the job they started two years ago, and immediately begins a hunt of his own -- fulfilling his pledge that "if I even feel somebody behind me, there is no measure to how fast I will bring this fight to your doorstep." Literally within hours he has former Agency cohorts in his crosshairs from a rooftop in Berlin, where a ball-busting mission director played by Joan Allen has lost two men, killed by someone who has framed Bourne for the hit. And with that, a game of kill-or-be-killed seems to be afoot. Infinitely smarter and savvier, more tenacious and more exhilarating than any James Bond movie, both "Bourne" pictures thus far (there's a third Robert Ludlum spy novel awaiting Gilroy's loose but ingenious adaptation) have been driven not by fight scenes or car chases, but by complex characters embroiled in engrossingly multifarious intrigue and played by riveting actors. Of course, that isn't to say the film is devoid of spectacular action. Bourne's hand-to-hand combat with another CIA field operative whom he's cornered for some answers is invigorating because it's bluntly realistic -- fast, brutal, messy, seemingly unchoregraphed and reliant on instinct and weapons of opportunity. And a climactic, think-on-your-feet taxi chase through the streets of Moscow has an unmistakable sense of place and an acute, steel-twisting intensity. Although this chase is diminished slightly by an overly fashionable editing choice from Greengrass ("Bloody Sunday") to set the pace with a thousand shaky-choppy, humming-bird-quick cuts that undermine the clarity of the action, these two scenes are otherwise typical of the sharp, boldly austere movie as a whole. It's an intelligent movie in which that aforementioned action-scene intensity is matched by a subliminal heartbeat of tension-building, bow-breaking string bass incidental music (by John Powell), and by every performance. 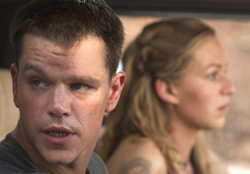 Damon fills the screen with his clench-jawed, near-silent potency as Bourne, who may be a highly trained killing machine, yet is anything but callous or indestructible. Brian Cox, returning as a treacherous CIA higher-up, shrewdly and slowly reveals his increasing anxiety over Bourne's loose-cannon threat to his clandestine operations. Joan Allen almost subconsciously portrays her tough-as-nails character's feeling that she's in over her head but not about to let it show. A few minor slips of stereotype and of more mechanical moviedom do surface from time to time in "The Bourne Supremacy" (Jason's photogenically sloppy, plot-expedient dream diary is obviously the concoction of a perfectionist production designer), preventing it from soaring into the realm of being an extraordinary film as well as a top-notch intellectual thrill ride. But for every such machination there's a balancing touch of authenticity, like the fact that when Allen seeks out Bourne's actual CIA file, it's just a cardboard box full of loosely organized documents -- not graphic-intensive data displayed on some brand-new flat-panel computer in an over-budget, cinematically pleasing underground office full of glass and chrome. These are the touches that make "The Bourne Identity" and "The Bourne Supremacy" the kind of thinking person's popcorn movie that will stand the test of time.